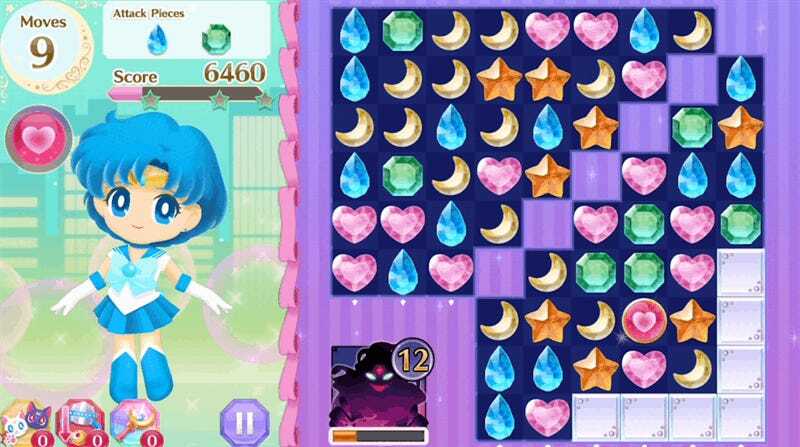 Released this week for iOS and Android, Sailor Moon Drops is everything you every wanted in a Sailor Moon game, as long as everything you wanted was a Candy Crush Saga clone. Sailor Moon holds a special place in my heart, having been one of the things my wife and I bonded over when we first met back in 2000. I’d buy her VHS copies for exorbitant prices at Media Play and we’d curl up in bed and watch them on and off for hours. Sixteen years later both VHS and Media Play are but fading memories, but Sailor Moon is enjoying a resurgence via Sailor Moon Crystal, which started airing its third season earlier this month. I was really hoping the fresh popularity would spawn a video game of some sort. I probably should have hoped a little more specifically. Sailor Moon Drops isn’t a bad game. It’s just not a very original one. Earlier this week I wrote about game adaptations of popular entertainment properties, how they are mostly mobile these days, generally copies of already popular mobile titles with a licensed stapled on. Then along came Sailor Moon Drops to prove my point exactly. It’s Candy Crush Saga with Sailor Moon characters. There’s a character selection feature allowing players to swap between Sailor Scouts, each with their own special skills. Static cutscenes appears as players progress through the levels, telling the story of the very hungry blonde girl and her posse of magic-powered girlfriends. The line which the levels follow branches now and then, revealing character-specific bonus levels. The formula is freshened up a bit, but it’s still a Candy Crush clone. Your enjoyment equation is how much you love/hate that genre of game plus how much you love/hate Sailor Moon. 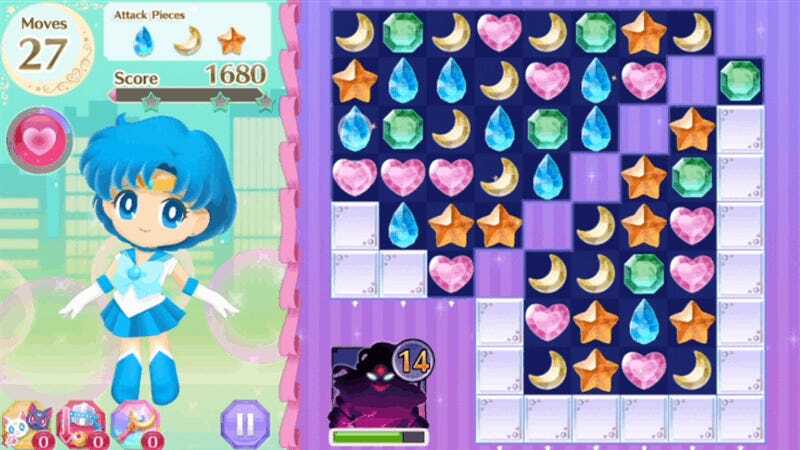 If it helps, Sailor Moon Drops is a very well put together Candy Crush clone. The characters are adorable. Making a match on the board has a tangible feel to it that’s essential to my enjoyment of a match three game at this point. It’s also a little too eager to start racking in that microtransaction cash. Thirty levels in and I’ve hit a wall, waiting for friends to help me unlock a barrier before I progress. I could buy some in-game currency to unlock the gate immediately, but I’ve not done that in years of matching three or more things and don’t plan to start now, no matter how much I want to collect the whole set of Sailor Scouts. A little good, a little bad and more magical girls than you can shake a scepter at. Sailor Moon Drops is available as a free download on Android and iOS from Bandai Namco, publisher of Dark Souls III. That both came out in North America this week tickles me to no end.